If you're wondering why I used the plural "peoples" which is grammatically incorrect in this context, well, I did it because I can, and you can't do anything about it!! As I often do, I'll begin this with a few general comments to address the latest subjects and recent frequently asked questions. Daiwa Australia continues to confuse people with different definitions of "Digigear" and its variants, which sometimes creates an illusion that some reels are better than they actually are. The new Saltist does not have better gearing than the 2016 BG, nor is it fully sealed. It's practically the same reel as the BG only with two mag-seals, one in the pinion and one in the line roller, along with a more streamlines bail wire connection. The Saltist works, but there is no good reason to buy it because you'd have what for all intents and purposes is the BG but with the hassles of caring for the mag-seals and the need for Daiwa to service them when the time comes. Same goes for the 2017 Saltist Nero, which in practice is nothing but a BG with a mag-seal in the pinion. I will not post a review of either to avoid repetition, especially with my last year's decision to be more selective with reviews to have more time for blog entries, yearly guides, and going after "studs" whenever they appear. I continue to recommend avoiding mag-sealed reels except the high end fully sealed ones because it's not worth the hassle. I know this warning covers the bulk of Daiwa's mid-range reels, but I only care about giving you the best advice I have even if it hurts a brand's feelings. Still with Daiwa, the 2016 Catalina has a mag-sealed ball bearing in the line roller, and the 2017 Saltiga BJ has a C6191 drive gear of the same type found in the Saltiga. 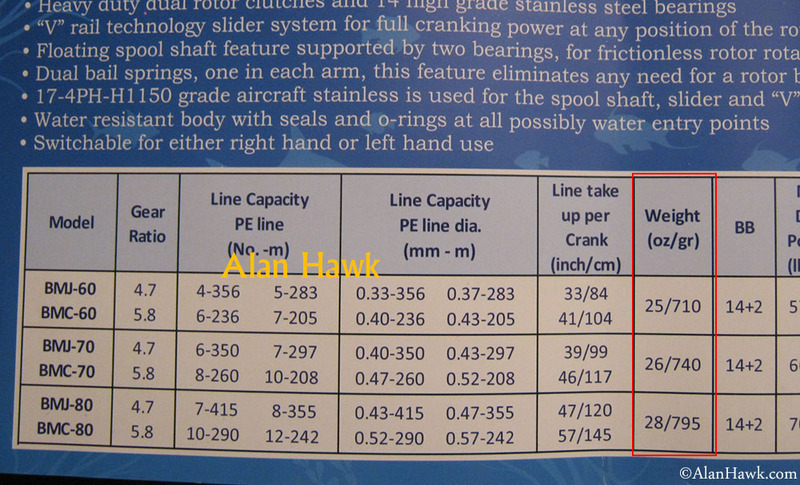 Daiwa Australia erroneously says that the Catalina has a rubber sealed line roller, which would lead to disastrous problems when people lube them and ruin the mag-sealed ball bearing, and they state that the Saltiga BJ has a "Digigear II" when it's supposed to say "Hyper Digigear" according to their naming. The "monocoque" concept is not that beneficial, and I'm hoping we won't wake up one day to find Daiwa telling us that the big game Saltiga family is obsolete because it doesn't have it, then force us to go buy some ridiculous 2019 or 2020 "monocoque'd" Saltiga! I won't be reviewing the Slammer 3 either. It's practically a mash-up of the Spinfisher SSV's twin drag system and partial sealing, and the brass gearing of the 6000 and 8000 Clash, both of which I've thoroughly reviewed. Line capacities are exaggerated, and the percentage you'll get depends on the size and how tight you spool them. Always be careful with advertised capacities because some brands get their numbers using unrealistic high tension machine spooling that doesn't match the reel's own oscillation pitch and with high strength-to-diameter lines. The line roller continues to be a challenge to Penn for some reason, and in the Slammer it suffers the same rubbing issues I demonstrated in the Clash. They put a bushing in the line roller instead of a bearing, and while in principle this can work and it does in other reels, in the Slammer I got mixed results at best; they work when clean and new, then they would only spin under heavy line pressure. Unless you will thoroughly clean the roller and keep it lubed, I recommend upgrading the bushing to a ball bearing. The bushing is an interesting choice in a reel that costs up to $350, and it can't be argued that it's a superior design or we'd have seen it in the Torque if they truly think so. The pinion is not sealed, and they count on a sealed ball bearing there which doesn't work since the pinion is deeply cut on both sides creating a wide channel for water to seep in. The backup anti-reverse carrier has no sealing beneath it. In comparison the fully sealed Spheros SW and Saragosa SW have a perfect pinion seal that comes straight from the Stella SW. The gearing of the Slammer felt less efficient than Shimano's counterparts, gear ratio differences taken into consideration of course. I might post a blog article on how to upgrade the line roller with bearings in two sizes later this year if you're interested. The wording is funny and gives the impression that the reel has a metal body, when in fact the frame, side cover, and rotor are plastic. I have messages from people who bought it thinking the body was metal only to find out that it's not. This needs to be fixed and more care is needed in the future. Today I'm once again reviewing a non-mainstream reel. These are the reels that come from lesser known or smaller brands that aren't widely distributed, as opposed to mainstream brands which are usually sizeable manufacturers with worldwide distribution networks. As is always the case with non-mainstream reels, if you find one that you like you should always consider other things such as availability of parts and service before deciding to to buy. 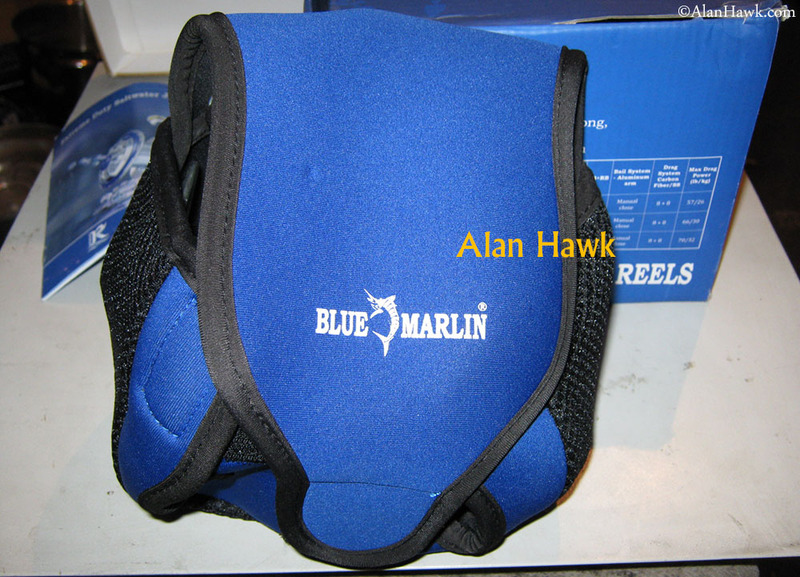 The reel reviewed today is the Blue Marlin BMC, and covered as well is its sister model the BMJ. Before I commence I need to tell you that sourcing the reels was different this time. While I've always played with prototypes and dealer samples to familiarise myself with a reel, whenever it was time for actual testing and review I would get retail reels that were bought anonymously so that I'd have exactly what you would buy. I avoid getting a reel directly from the manufacturer fearing that I might get a "special" reel since they know it will be the basis of a published review. This time though I got the reels directly from Blue Marlin since it's pretty much the only way to get them. At the time of writing only a couple of retailers in North America sell them, but these currently have only two models out of six. 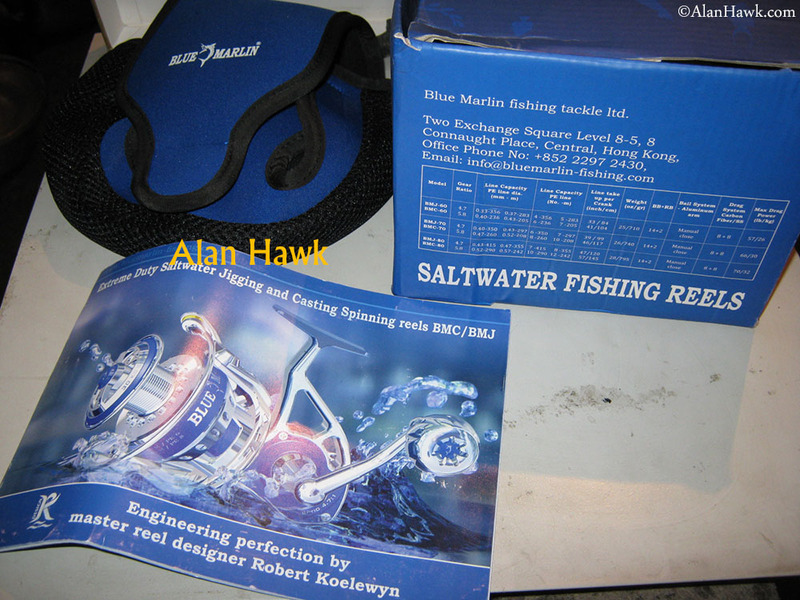 I have no reason to believe that my Blue Marlin reels are special or select reels in any way, but nevertheless I had to tell you. Yep. Blue Marlin initially marketed it in shows and magazines under the "Makaira" name, but it turned out that Okuma owns the trademark to the name, and upon request from Okuma Blue Marlin changed it to BMC/J. I don't believe they intended to copy Okuma's model naming. 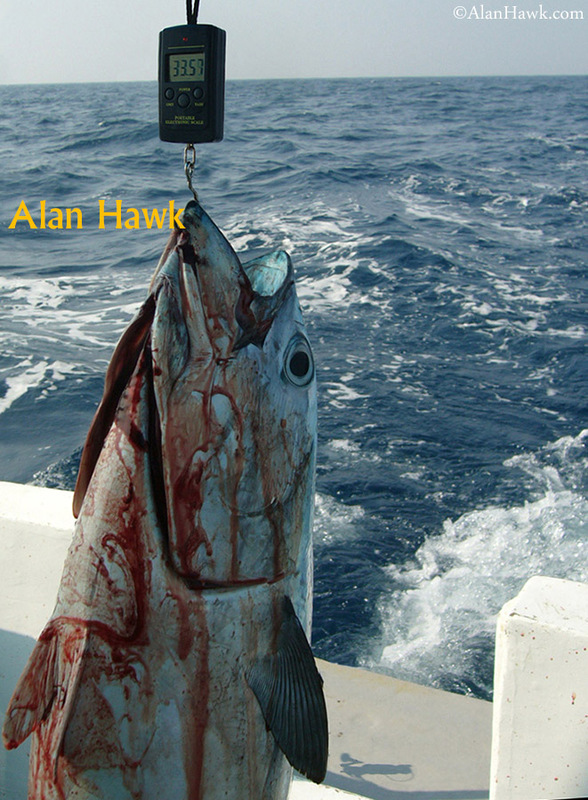 "Makaira" is the Latin name of the Atlantic Blue Marlin fish, which might be where "Blue Marlin" company got the name. There is no mention of the country of manufacture, but it's made in China. I find the reel to be pleasing to the eyes. The design is very minimalistic and straight forward, giving the reel a serious look that's more about getting the job done than elaborate embellishments. The skeletal frame and exhaustive porting in the rotor and spool bear an unmistakable influence from the surf reels the designer is known for. Speaking of influence, Daiwa's air rotor has now become one of the most influential designs in modern reels, rivalled only by Shimano's brain child the floating shaft. Here we see the famous cut outs where Daiwa's engineers once figured that material was not needed. The rest of the rotor is quite original though. The bottom of the spool's skirt (red arrows) sinks a little into the rotor wall, and this raised wall (X) functions as a discreet support beam for the rotor arm (blue arrow). The higher the support beam meets the rotor arm, the better the arm will resist bending moment generated under load. It sounds complex, but trust me, it's a very smart thing to do in a blue water spinning reel. This is the first of several innovative design features in this reel. The three sizes of the reel share the same body, with only rotors and spools being different. The BMC models have blue side covers and blue drag knob caps, while the BMJ models have silver ones. The reel comes in a box that has the information of all the models so it can be used for any of them, a manual, and a reel bag. I really like the bag. It's well made and stretches to cover large reels. 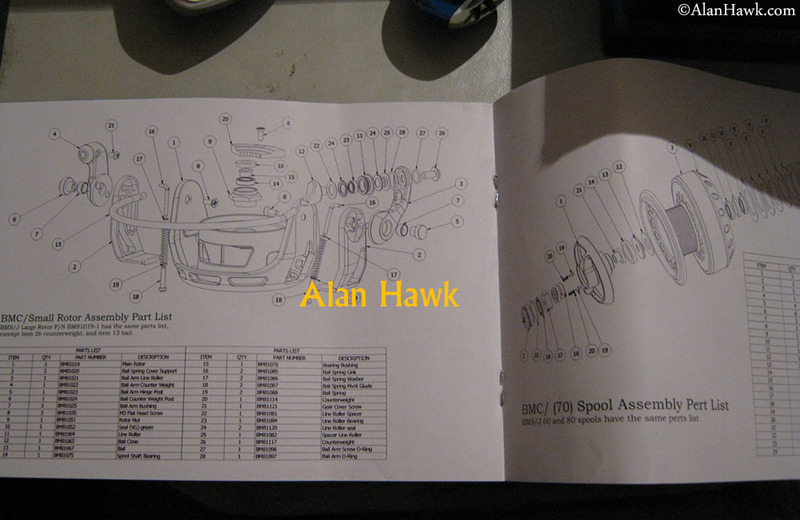 The manual has parts lists and warranty information. And an announcement for smaller models in the pipelines. This is an expensive reel. The 60 is priced at $750, the 70 at $800, and the 80 is priced at a whopping $900. First impressions of the reels are that they are solid, have excellent external finish, and are moderately smooth. Again, the correct definition of smoothness is the quiet and fluid gear operation without whirring, noise, or irregular feel. The ease of turning the handle though is called "free-spinning", and these reels would score about 3.5 on a scale of 5 in free-spinning where 1 is the tightest and 5 is the freest. Not bad at all considering that all sizes of the BMC/J are fully sealed with rubber gaskets. The specifications chart is very impressive. 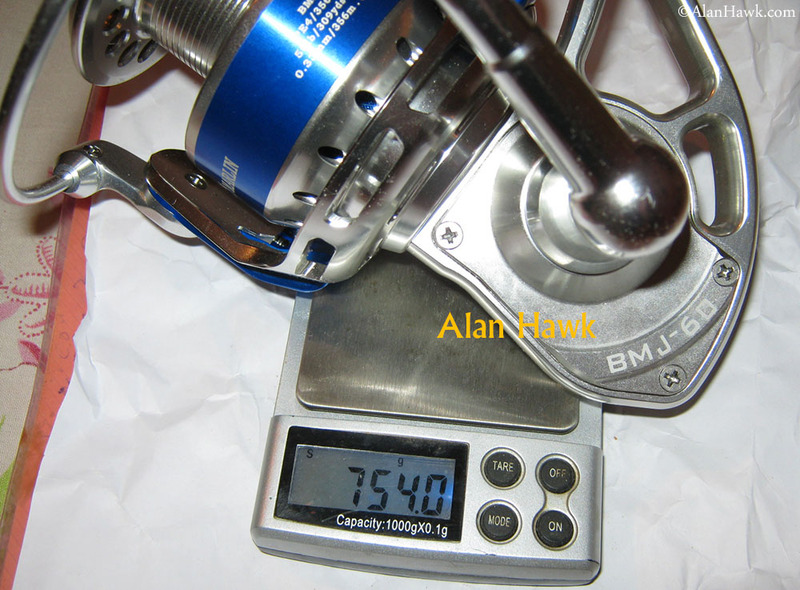 It states that the weight of the 60 and 80 models are 710 and 795 grams respectively (25 and 28 oz). In reality though the 60 is 754 grams (26.6 oz) and the 80 weighs 821 grams (29oz). The tray in the photo under the 80 was of course accounted for and the scale zeroed with it. I have not tested the 70 size but one can safely assume that the listed weight for that size will be off as well. The wrong weights are featured everywhere including on the official website at the time of writing, so these need to be changed. To put the actual line capacity in familiar terms, the 80 holds about 92% of what a 10K Shimano Spheros SW or Saragosa SW holds, and the 60 holds about the same as 6K Spheros SW or Saragosa SW. 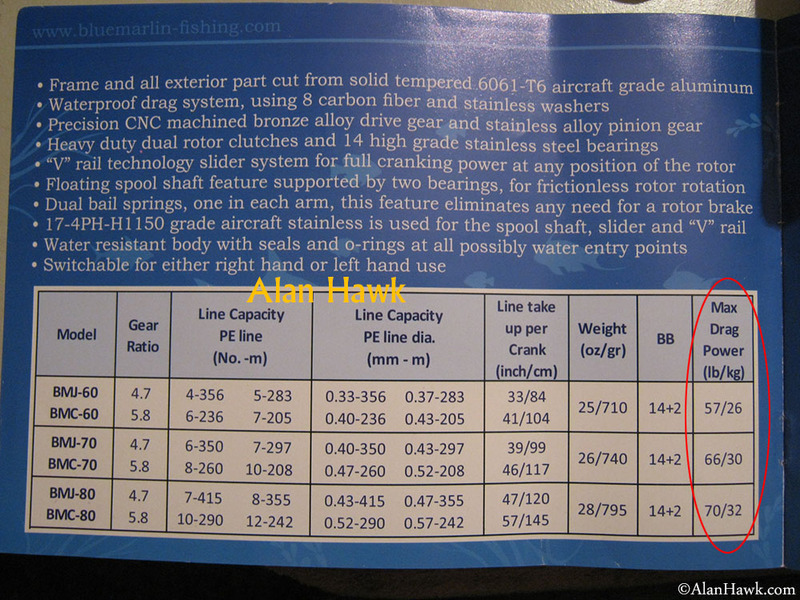 The capacity/weight ratio for the Blue Marlin reels therefore is not satisfactory. While the spools are wide and deep, they lack in height, which hurts capacity. Still in the manual, the reels come with some serious maximum drag claims. 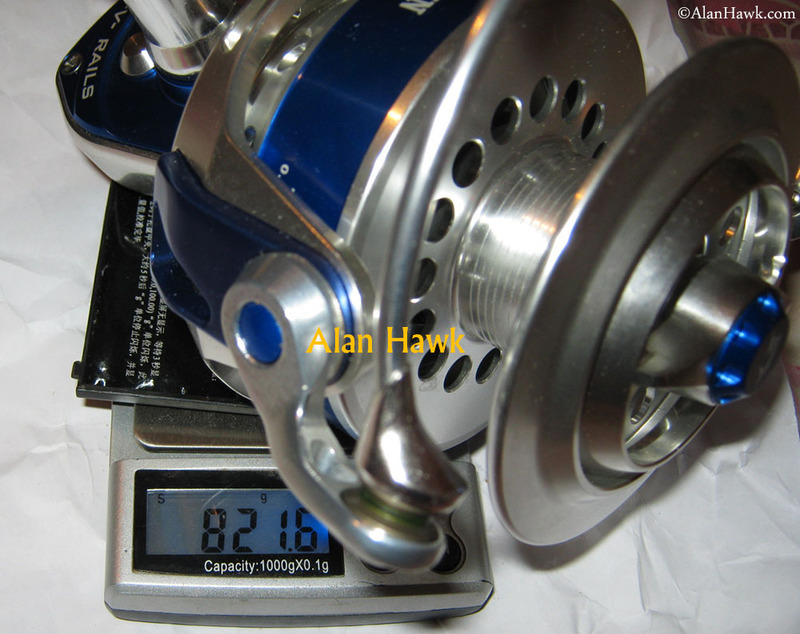 The claimed 32kg (70.5 lbs) of maximum drag for the 80 size is the highest claimed drag of any spinning reel in current production, save a reel called "Lurekiller Saltist" which is a trashy back-alley Chinese reel that's sold under a lie that it's made in Japan, with a claimed 35kg (77 lbs) maximum drag. It's easy for a brake system to produce extremely high pressures, but the real challenge is if the reel as a whole can survive under that high stress and still functions correctly. 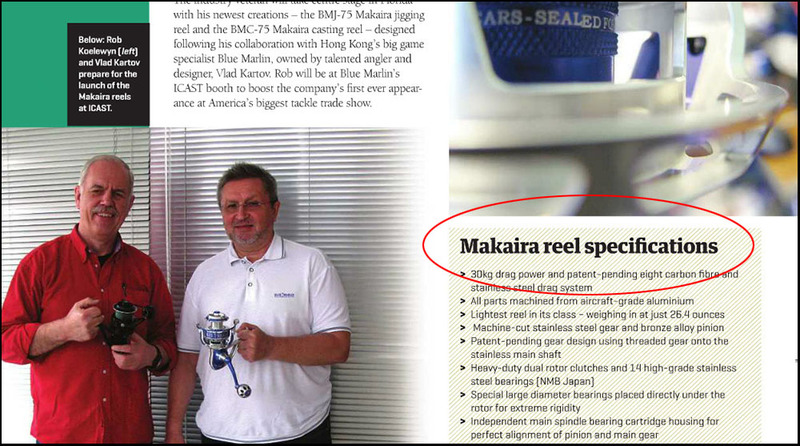 Anyway, seeing those claims left no doubt in my mind that Blue Marlin company believes that the reel belongs up there in the realm of maximum capability spinning reels, which remains a very exclusive club that many have tried but failed to enter. Will return to the drag later. You can see the damage where the seat pushes against the foot's metal. For lighter jigging I was forced to file the bedding of the seat of a cheaper Lemax Slim Max 120g rod and mated it with the 60 BMJ reel, but for the 80 I had to resort to taping the reel to the seat because I wasn't going to destroy heavier rods for the sake of that stupid foot. Nothing against big feet here, I actually enjoyed massaging and tickling a pair in the past, but these were attached to a Romanian girl who did things to me that are punishable by public flogging in some countries, not to a bloody reel! Moving to the spool, it's worth mentioning that the reel was initially produced with an attached stainless steel spool lip to resist scratches and reduce friction with braid during a cast, but later on this ring was dropped. This is the current lip, an integral part of the spool in the basic fashion. I can't comment on the difference in performance since I have not tested the early reels with the stainless steel lip. The hard lip is still featured in the manual that came with the reel though. The drag setup is another novel design. The washers go into the bottom of the spool, but they fit inside the spool's spindle just like in a standard top stack. This is different to the classic bottom drag where one or two large washers apply pressure against the spool's bottom flange. I'd call the drag of the BMC/J a "bottom stack" setup, and this design is found in the Van Staal VR reels as well. While this bottom stack setup has no operational advantage over the top stack, it provides better protection to the drag washers from water intrusion being protected by the spool's skirt in the back. According to the schematics, there are supposed to be 6 carbon fibre brake washers there, but apparently these were producing more force than needed, so they replaced one of them with a polymer washer in the 80. In the 60 size though I found 7 brake washers, probably made before they realised they could work fine with just 5. The drag clicker is two spring loaded bars (red arrows) that click against the cuts in the drag stack cover (blue arrow). 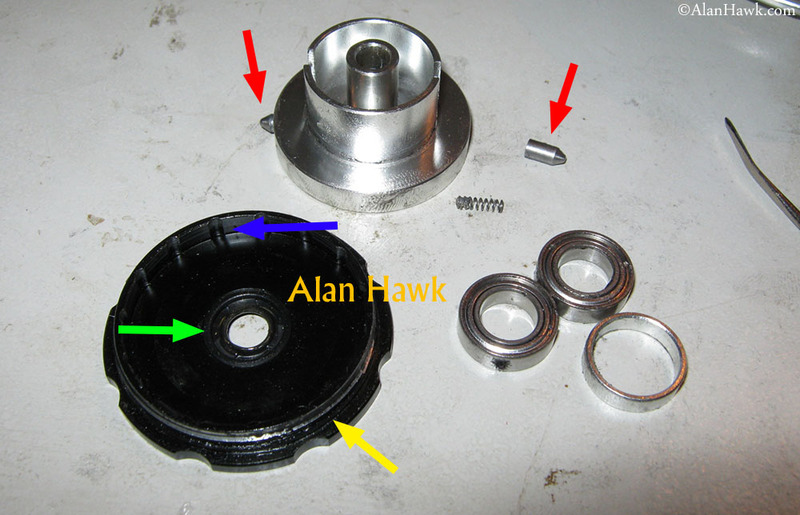 Seen in the photo as well are the two ball bearings the spool spins on, the outer seal of the stack cover (yellow arrow), and the inner seal of the stack cover which is an "oil seal" (green arrow). I discussed this type of seal when I reviewed the previous model of the Van Staal Bailed reel years ago, but again quickly oil seals are gaskets that have more contact surface and grab parts tighter than flat washers or O rings, therefore they are used to achieve higher sealing performance. That cover had a bit of metal shaving left when the threads were cut. No big deal but as usual I share all my observations with you. The drag clicker is easy to hear in the noise of the sea and proved very durable in the 80, but in the 60 it was problematic. When the drag is tightened on the 60, the clicker goes completely silent. Initially I expected it to be an issue with a spring and continued to fish it silently, then upon disassembly and inspection I found that both springs were fine. For some reason the stack cover of the 60 was not working correctly with the spool of the BMJ 60, but when I replaced it with the cover of the 80 it worked like charm. I examined everything fanatically yet I couldn't find a reason why the stack cover of the 60 was not working while the 80's was! The best I could come up with was a theory that remains unconfirmed, but here it goes anyway; these are the two stack covers of the reels side by side. On the left the cover of the 80 has a smooth edge then the threads begin about 2mm above it, but the cover of the 60 is threaded all the way to the edge. My guess is that for some reason the threads on the edge of the 60's cover were preventing it from going all the way down when installed in the 60 spool, therefore when the drag is tightened in the 60, the clicker disc is pushed away from the partially unseated cover which has the clicking cuts, and the spool then becomes silent. Whatever the reason is, a fact remains that the 60 came from factory with a faulty clicker, which is a sign of problems with quality control and consistency. Not related at all, but I also noticed that one of the covers had the oil seal in the right direction while the other had it reversed. Nothing terrible, but another indication of quality control issues. 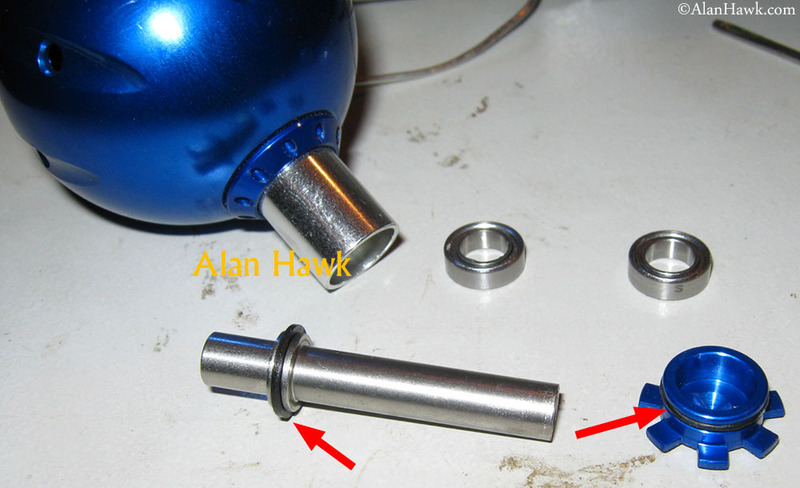 On the top there is a tiny drag washer that functions more as a spacer than a brake disc (red arrow), and the very effective sealing around the drag knob is achieved via another oil seal (blue arrow). The drag knob has an internal micro clicker (red arrow) that works in conjunction with a brass disc (blue arrow) to produce a clicking sound when you adjust the knob, and more importantly to prevent the knob from turning and changing the drag sitting when the spool spins during a fight. The green arrow points the seal of the drag knob. Unfortunately that brass disc is quite soft and not very well made. You can see in the photo above how it deformed in the centre where it's keyed to the main shaft, and the small circular indentations that create the clicking sound are very shallow, so this knob was not making the clicking sound. For comparison the disc from the other reel has clearly deeper indentations, and this knob was indeed making proper clicking sound. It's deformed in the centre as well, but to a lesser degree because it wasn't used as much. Again, we see two parts that are supposed to be identical because they are actually the same part, yet one of them is stamped deeper than the other. More problems with quality control and materials. The indentations on all discs need to be of the same proper depth, and a harder brass alloy is needed. Sounds and minor stuff aside, the performance of the drag on the water was not very satisfactory. At the beginning it worked fine, but with some use it developed slight jerkiness at the beginning of movement, and even while turning the release of line didn't feel uniform and I could sense the resistance fluctuating. I cleaned and lubed the washers thoroughly, but it didn't help, and it got worse as the drag pressure increased. It's not the kind of disruptive performance that's guaranteed to lose the fish, but it made me nervous nevertheless. My only resort around that was to fight fish on much lighter settings than one should, which is bad for both the angler and the poor fish, in addition to being a waste of time. For instance this one took me about 40 minutes to land on the BMC 80, which is absolute rubbish because usually a fish of this size takes me 10 minutes at most on a bad day. I apologise for the blood and carnage. I treat my catches with proper respect and never let a fish suffer or thrash around, but sometimes the gaff hits the gills or belly and inadvertently causes excessive bleeding. I rarely have anyone around so I do my own gaffing one handed while controlling the rod with the other hand. These are the culprits. The drag washers are simply horrible. They aren't a full mesh of fibres, but rather a solid strip in the middle with a thin layer of fabric attached to each side. They don't compress, the surface isn't even, and after a little while they fall apart and the fabric falls off the middle strip as seen in the photos. These horrendously low quality washers don't belong in any serious reel. Final word about the spool, it doesn't have removable shims to adjust line lay because of the way the drag sealing is done. This is how the 80 lays line, of course photographed before I joined the leader to show it clearly. There is a slight gap at the bottom of the spool, which could have been remedied easily by adding a spool shim, but unfortunately not an option here. Beneath the spool everything is neatly done. The main shaft is protected by another oil seal (blue arrow), and the counter weight (red arrow) double tasks as a nut retainer. A very important thing to note here is that in the BMC/J reels the bail arm can be attached to either rotor arm, so be careful when you assemble the reel to make sure the bail wire is pointing in the opposite direction to the counter weight. If you reverse it and the wire pointed in the direction of the weight, the balance of the rotor will be thrown off and it will cause wobbling. In other reels the bail arm will only fit in one rotor arm, but here it can fit in either one hence the warning. A better view of the oil seal of the shaft, and a ball bearing in the nut to insulate the rotation of the rotor from the main shaft. This usually constitutes the first half of the "floating shaft" feature. More about it soon. Continuing the full sealing, the back of the nut has an O ring seal. 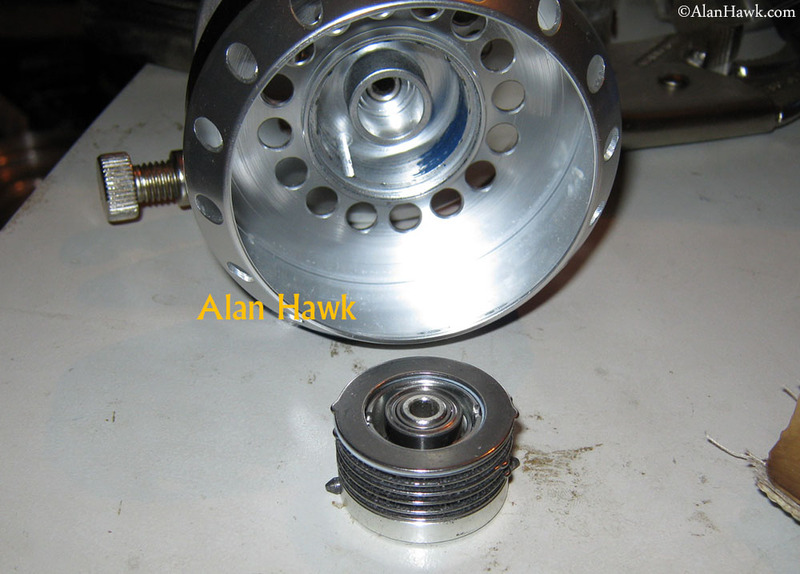 The screw-in cap that retains the clutch/pinion assembly is another Daiwa design that went "viral" beginning with the 2001 Saltiga. Seen here in conjunction with the rotor seal (red arrow), and -surprisingly- a synthetic bushing between the shaft and the pinion (blue arrow). This bushing is usually used as a budget version of the floating shaft when the reel doesn't have a ball bearing in the nut, but since this reel already has the nut bearing, the bushing serves no purpose here and only adds redundant friction. The inner end of the pinion too has a bushing that fits between itself and the shaft, creating more redundant friction and practically killing the floatation of the shaft. In a properly designed one there is a bearing in the rotor nut, then there is only air between the shaft and the pinion (hence the "floating" name), and inside the gearbox there would be a second anchor point for the shaft completely independent from the pinion. For instance in the Stella that second anchor point is the oscillation block, and in the Saltiga it's a washer in the body post. Beneath the cap there is an O ring seal. The carrier unit houses the anti-reverse, and a large diameter ball bearing (red arrow). This ball bearing is not one of the pinion's 2 bearings, rather it's a separate bearing for the rotor's neck. Another unique feature that comes in handy when the reel is under too much pressure at high drag settings. The carrier's parts, with 2 anti-reverse clutches (red arrows) sharing the same sleeve (blue arrow). This is not a first since double clutches were previously used in reels such as the Team Daiwa X HIA and you can even see it in the Ryobi Carnelian I reviewed 5 years ago. Double clutches are a double edged sword; they increase the braking reliability, distribute stress for longer service life, and one clutch works as a backup for the other in case of slippage (except in cold whether where two clutches will slip simultaneously). On the other hand they increase friction in the mechanism and add weight to the reel. Ultimately it's one more option out there that has its pluses and minuses, and options are never a bad thing. Both reels had unacceptable amount of back-play in the anti-reverse from the get go. It did not increase with use, but it was particularly annoying when jigging. You can feel the rotor slap back all the time. This is why. 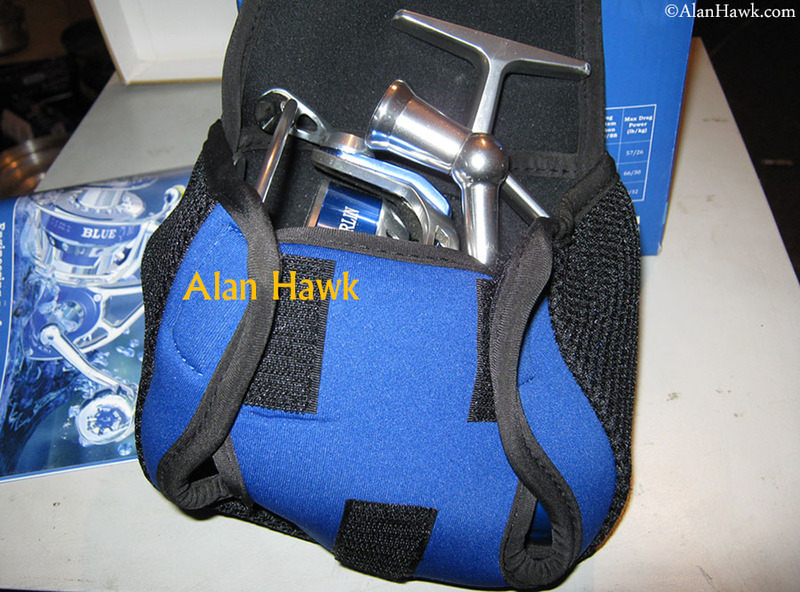 The clutches themselves are fine internally, but there is a lot of play between the clutches and the carrier. This play is not needed for the proper functioning of a double clutch system, and it has nothing to do with the self-centring free rings that produce a click but no back play at all. This is nothing but sloppiness, and it kinda turns me off because there is no way they didn't see that play nor were told about it by every person who fished the reels. It's too obvious to go unnoticed. Inside the clutch plastic V springs control the brake cylinders, and they work fine. Remember that the play was coming from the outside. This is the first bearing of the pinion. Its position is quite deep, therefore the extra bearing for the rotor's neck shown earlier is of great importance. The side cover, showing the handle seal. The handle seal is not in contact with the drive gear's shaft on either side. Only when the handle is inserted that it comes in contact with the seal, therefore the reel operates against only one of the two gear seals at a time. This mitigates some of the excess friction created elsewhere by the redundant shaft washers. The opposite side is protected by an O ring seal in the cap. The gearbox has a full perimeter seal on both sides. Accessing the gearbox requires the removal of 4 screws only without the need to disassemble anything else, which is a great advantage that simplifies regular care and lubing. The drive gear is quite tricky to remove though, but you don't need to take it out and can simply lube it with some grease on the tip of your finger and it will take the lube to the pinion as it turns. Some of the brass shims of the drive gear were beginning to oxidise and build a layer of corrosion that's thicker than standard tarnishing. Gave it a quick cleaning and a layer of grease for protection. 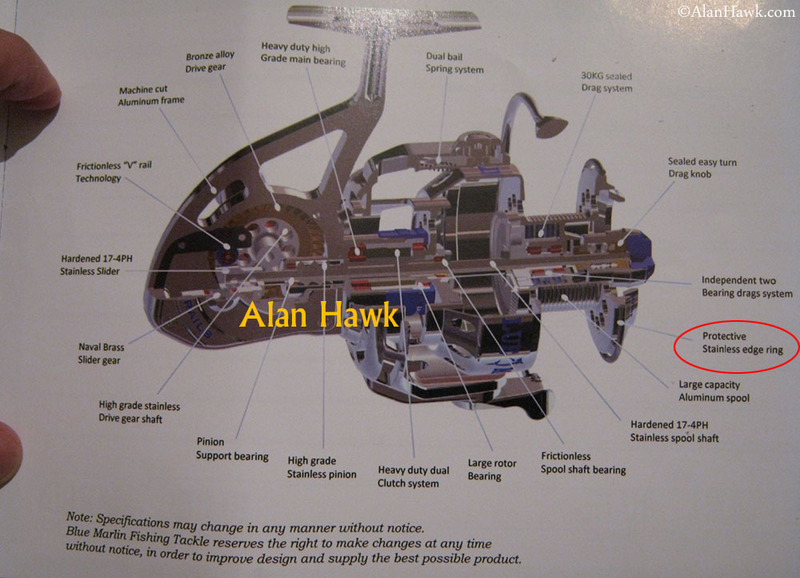 The interesting gearbox design, with the "hatchet" style pinion tube (red arrow). This design allows the insertion of the inner ball bearing of the pinion at the end of the tube, and negates the need for a centre post in the body. 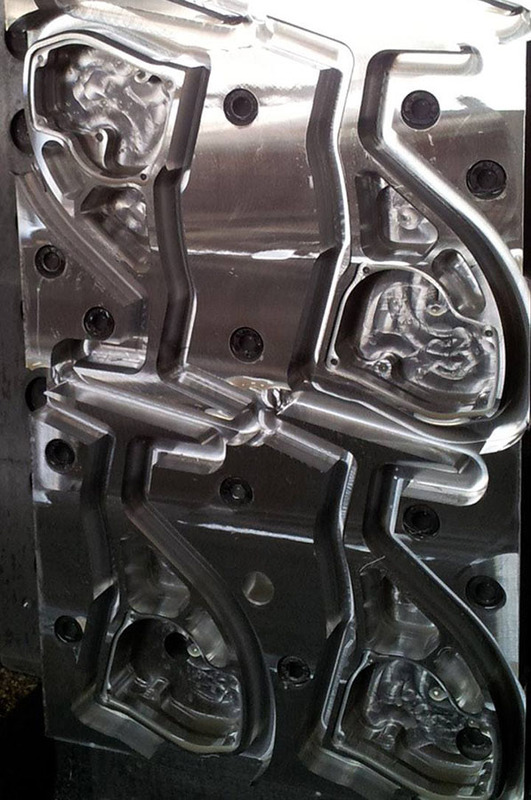 In this photo you can see the thick walls of the body, which is machined from a rigid 6061 aluminium alloy. These are the frames being machined. The powerful frame, coupled with the rotor with its discrete support beams, make up the main theme of this reel; very strong but without weighing too much. On the water I couldn't up the drag too much because of the issue described earlier, but on dry land I scaled the BMJ 60 successfully to its claimed maximum of 26kg (57.3 lbs) of drag, and the BMC 80 to 25.5kg (56.2 lbs) before the rotor arm came too close for comfort to the wide spool. These numbers are quite impressive because while many reels claim all sorts of numbers, only a handful of them are structurally strong enough to handle them without something bending, jamming, or breaking, and these reels are often heavier than the BMC/J. The designer's skills shine in this area. The oscillation gear is machined brass, spins on a ball bearing, and has a stainless steel sleeve (red arrow) to reduce wear and friction with the oscillation block. 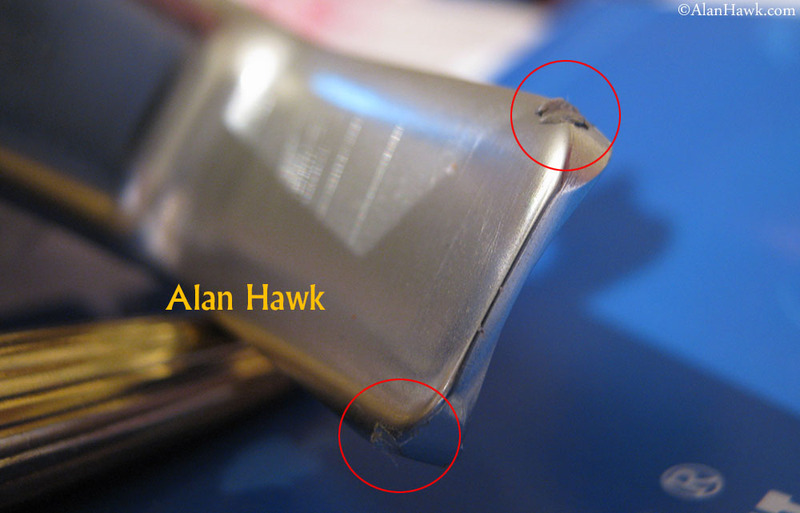 The oscillation gear's retaining screw is not threaded into the aluminium side plate, but rather into a stainless steel fixture (red arrow) inserted into the body. And of course this fixture has an O ring seal for waterproofing (red arrow). Using this stainless steel fixture allows them to keep the side plate thin and light, and if you over-tighten the screw no harm will be done since the screw threads into stainless steel and not into the aluminium frame. The oscillation gear rests on a Teflon washer (blue arrow) for smooth spinning. .... those guide rollers ride on a V shaped rail made of stainless steel that's inserted into the frame. Here is how it looks with the block riding the rail. This is a very low friction system that is almost as smooth as the familiar one where the oscillation block rolls on vertical bearings, but its main advantage is that it could potentially be used as a second anchor point for the main shaft since the oscillation block is securely trapped between the rails. I said "potentially" because in this reel there is too much play between the rollers and the rails for it to act as an anchor, hence that anchoring task is left to the second pinion bushing shown earlier. The description of the V rail in literature as "supporting the shaft at any rotor position" is therefore incorrect. So, the rail doesn't achieve its full potential and the shaft still relies on traditional support, nevertheless it remains a perfectly functioning design that moves the oscillation block smoothly under load when the spool is being torqued by the running fish. Now there is a solid third design in addition to the block with vertical bearings and the rod mounted block to choose from. The gearing of this reel went back and forth between bronze pinion and stainless drive, then stainless pinion and bronze drive, and seemingly finally settled on machined stainless pinion and machined stainless drive gear in all models and sizes. The drive gear's shaft is male (red arrow), which usually translates into smaller gear offset and better efficiency, but since the gear here is screwed onto the shaft, the middle section becomes too thick to garner these benefits (blue arrow). The meshing of the drive gear and pinion is not very accurate as the wear marks on the teeth indicate, with about 50% of the tooth only coming in contact with the pinion and the rest remaining intact. Doesn't hurt much in this reel since the stainless steel alloy used is quite good and the gear is not going to break even if the contact area is less than it is now. Better contact is essential though in gearing systems made of lesser strength alloys to distribute load and reduce stress that can cause fractures. Similarly tough pinion, and to my eyes it has a very good wear rate. Here is the unhappy part though. As a rule I always assign some time to testing every ambidextrous reel with the handle attached to the right side just like a left handed fisherman would use it (or occasionally right handed ones too). I never faced any problems with this, except this time the reel failed the right side test and the gear shaft bent on the right end. This is a subject where great care is needed. In theory, when one uses a spinning reel they should pump with the rod then reel in the slack, therefore the handle should not come under too much pressure. That's easy to type on a computer or state in a conversation over lunch, but in actual fishing there are situations where the handle will inevitably be stressed. Your drag is set to 15 lbs, you drop your jig, you play it fast and reel quickly, then a lightening fast Amberjack strikes it and for a second you find yourself reeling against the fish. Alternatively, you're fighting a medium sized tuna, then it suddenly charges towards the boat and you start frantically reeling the slack then in a blink it changes direction and you find yourself reeling against the running fish momentarily before you can react. This is exactly what happened to me with the handle on the right side, and I felt it the moment the shaft got bent. My assessment of the situation, which you are free to to accept or reject, is that I indeed put a lot of pressure on the handle when it happened, but it's an amount of pressure that does not cross the line into the land of excessive, and I believe a reel of this class should've been able to withstand it. The handle was stressed similarly and even slightly more multiple times when on left side and it took it without a hitch. This photo shows it better. Not something that halts or ends a fishing trip, but a serious failure nevertheless. I discussed the matter of strength in ambidextrous reels in detail nearly a decade ago, but in a nut shell this remains a challenge to the makers of heavy duty spinners because in order to create a reel that can quickly be switched between right and left hand winding, one side of the connection needs to be smaller (weaker) than the other. 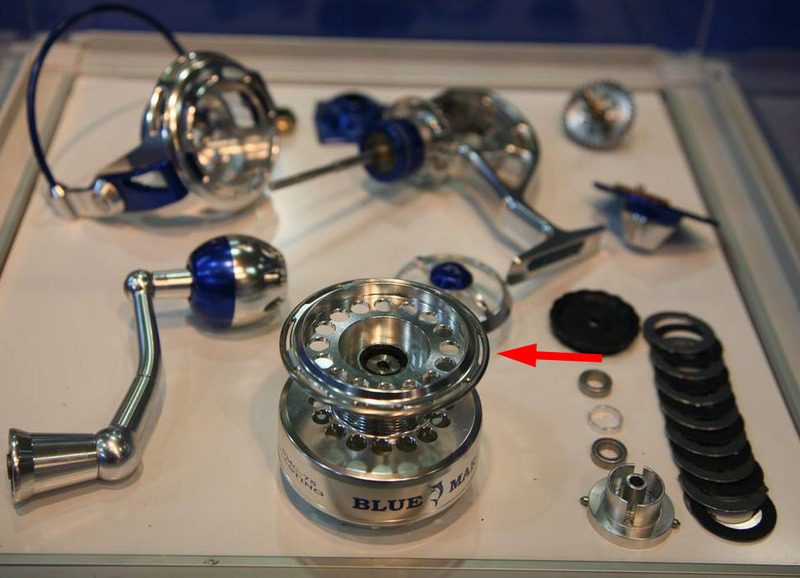 Most spinning reels have a female gear shaft because it's thicker and more resistant to bending, and the male handle shaft would then face lesser risks because when its thinner threads are engaged the entire length of the shaft is buried inside the female gear shaft and protected from bending. A serious super spinner like the Stella SW goes even further, with the bigger reel sizes coming with an extra handle shaft of equal diameter that needs to be swapped before changing the winding side, and this way no side of the connection is weaker than the other. In the Saltiga they insist on using a male gear shaft for the sake of lesser offset and more gear efficiency, which is quite thin, but they opt for an immensely strong alloy at great cost not only for the price of the alloy but also for the toll it takes on cutting machinery at the factory. Both manufacturers know that in big game fishing the handle will be stressed, and they took protective measures. What happened here is that the Blue Marlin has a thin male gear shaft, the alloy wasn't strong enough, leading to the failure of the thinner right side. You've probably grown bored of hearing it, but the bail is yet another innovative touch. It's a manually closed bail, and it has a spring on each side instead of just on one side. This holds the bail open securely and makes it virtually impossible for the bail to close inadvertently during a powerful cast. In addition to the two springs, the bail is quite unique in having a very early toggle position. 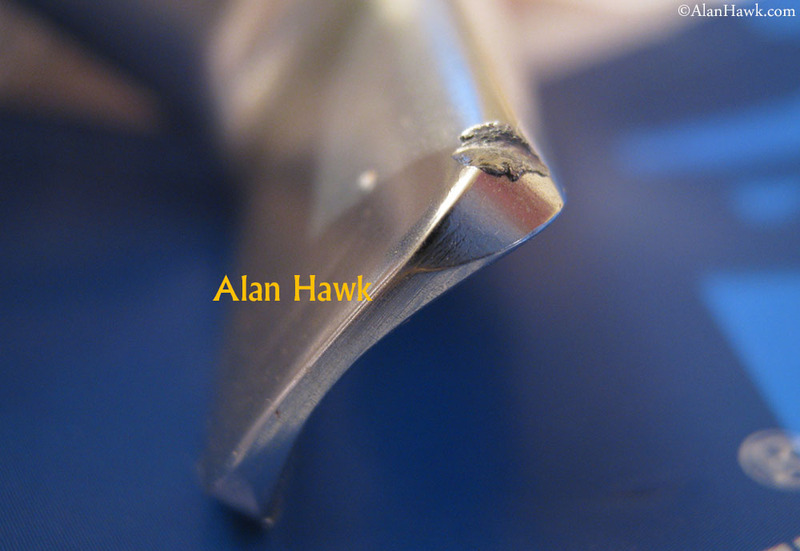 The photo above shows the bail in the equilibrium position, and touching it slightly would make it snap open on its own. Usually you need to push the bail much farther to reach the toggle position. It's something that is quite different that you'd either like or hate, and I personally like it for the speed with which I can flip the bail open even if it takes a bit more time to close it than in other reels. Another problem that I caught in the 60 immediately after I opened the box. In the BMJ 60, the bail would not clear the drag knob when the spool is at its highest position. This does not happen in the 80 size. Since I found this one early I talked to the company about it, and they suggested it might be a wrongly assembled reel. Now that I've taken it apart I could find nothing that indicates a bad assembly or wrong parts. This has nothing to do with the drag cover discussed earlier since the shaft goes through it. I removed half the drag stack and tried and it still hit the knob, I tried with the knob from the other reel with the same result, I checked the bail wire to make sure it's not bent, and I even examined the rotor arms and bail arm closely to make sure every part was in good shape and correctly assembled. You probably recall that I highlighted this exact fault in both the early Accurate TwinSpin and the early Omoto Severo, which leaves me scratching my head as to why the industry keeps repeating this mistake. Anyway, this should be an easy fix by elongating the bail wire, and hopefully rebalancing the rotor afterwards with a new counter-weight since a longer bail wire would throw the rotor's balance off. 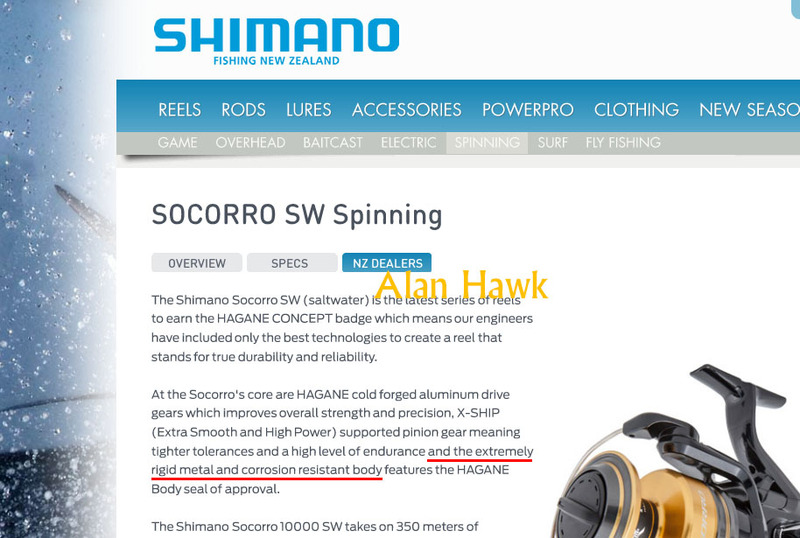 I wouldn't be mad if they did not balance it though; when Shimano recalled the 2008 Stella SW to change the line roller they added a tiny bit of counter weight to rebalance the rotor for the new roller in Japan, while in the US Shimano would mail the new roller alone and say nothing about the need to rebalance. The bail arm is well sculpted and quite strong. And both the bail arm and the end piece at the opposite side are fastened to the rotor via an independent stainless steel fixture as seen earlier with the oscillation gear. 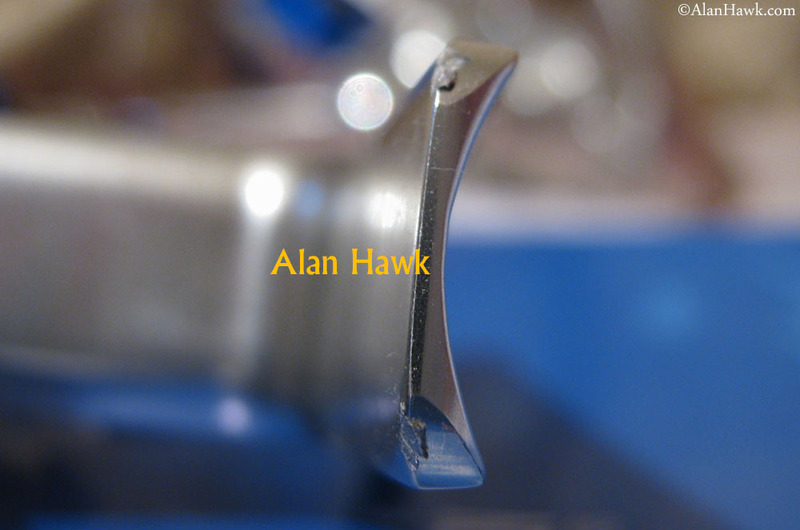 The screws (blue arrow) are threaded into this stainless part (red arrow) instead of threading into the aluminium rotor itself for durability. Both stainless fixtures have protrusions that fit into recesses to prevent rotation, so there is no risk of the screws becoming loose with repeated cycles of opening and closing the bail. How cool is this? The line roller is well designed and finished. The retaining screw has its own seal on the bail arm. Another seal on the roller's side. And the line roller itself is additionally sealed on both sides. The line roller with the two O rings on the bail arm are found in the Van Staal VR. Actually a good number of parts in the BMC/J is shared with the VR, but I skipped details not to make the review even bigger. This means you can buy certain parts for your BMC/J from Van Staal. Ask me if you want to know about a specific part. 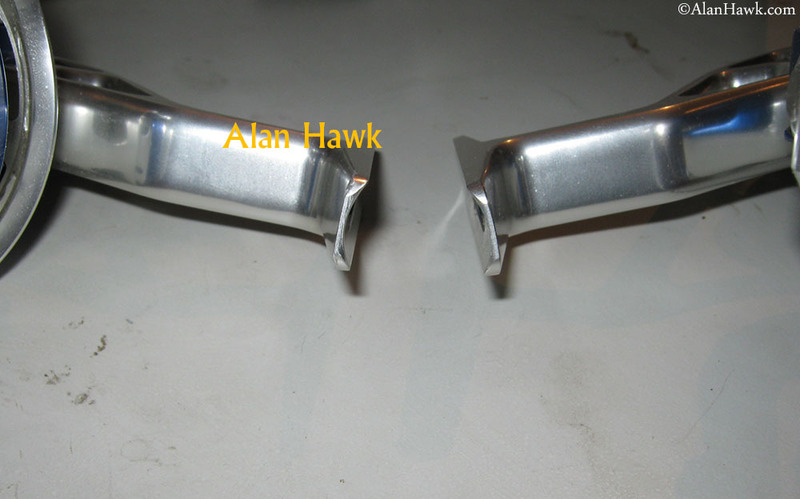 The handle is a rugged machined aluminium one. A stainless steel threaded shaft is inserted in an arrangement that's similar to high end Daiwas, but here it's retained with a permanent pin instead of a screw, so you can't disassemble the joint in the Blue Marlin. Found some corrosion in the hole of the handle's knob from exposure to saltwater. Nothing major, just shallow pitting and a spray of WD40 followed by a layer of grease should stop it from going further. The knob is sealed on both ends (red arrows), and runs on two bearings that remained in top condition throughout the testing. The knob itself is comfortable and the grip has drainage holes to reduce slipping when your hand is wet. 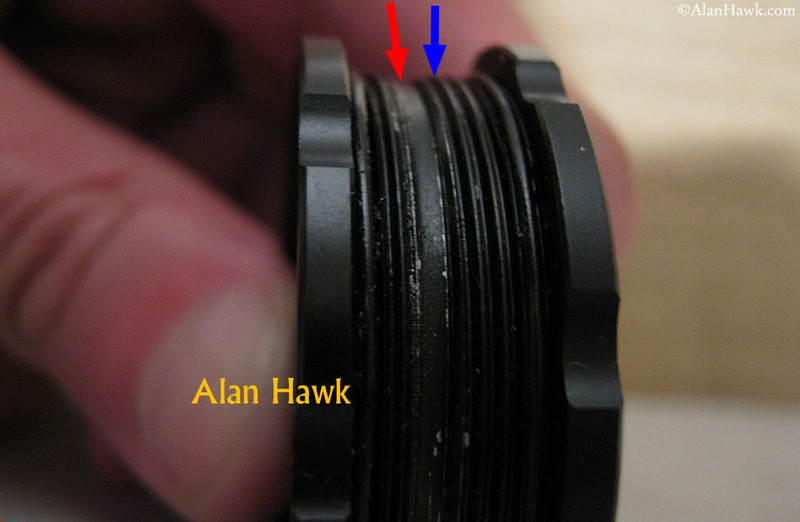 The knob of the BMC 80 though became loose during the first spooling of the reel when the retaining nut (red arrow) turned on its own and became partially undone. These are the threads where that nut is threaded. I hand tightened it and it never moved again, but a bit of purple Loctite (low strength) at the factory would keep this from ever happening. Here is my take. For almost three decades now the Japanese have had a virtual monopoly on innovation in fishing reels, and everyone else is more or less copying them. It was therefore quite refreshing for me to see this amount of creativity in one reel, and from the mind of an American designer. Nothing against the Japanese, but one misses the time when creativity was coming from every direction and one could hardly keep up with what the Germans, the French, the Swedish, the Italians, and the Americans were coming up with, and that competition in ideas gave us some great gear and wonderfully engineered reels. That time is gone though and globalism has successfully annihilated national pools of talent almost completely, so finding something that's created with ingenuity that rivals that of the Japanese was a much welcome change. 1) Replace the drag washers with ones of acceptable quality. 2) Adjust the reel foot to proper dimensions, which should only require a simple software adjustment since it's machined and not cast. 1) Rectify the play in the anti-reverse housing. 2) Increase the length of the bail wire in the small reels so it can be opened at any spool position. 3) Quality control needs to be improved so that no parts will be sub-par or flawed. 1) Secure the assembly of the handle knob so it won't come loose. 2) Wipe some grease on areas susceptible to corrosion, like the brass shims of the drive gear and the hole where the handle's knob is attached. 3) Reduce the price because currently it costs more than the 2016 Catalina, an established super spinner that now has the same gearing as the Saltiga, and it's even too close to the price of the Saltiga itself. In the past I found several top reels to be faulty at introduction, but companies took measure to address the issues and some of them eventually became favourites of mine in their perspective categories. I hope in my heart that this will be the case here, and that one day I will add the familiar follow up at the top of this review in red font telling fishermen that it has been perfected and that I verified it first hand. Whether that happens or not, I wish Blue Marlin and everyone who is willing to make something new the best of luck. That's all for now. I fished this reel side by side with a couple of others, so more reviews will be coming in the near future. 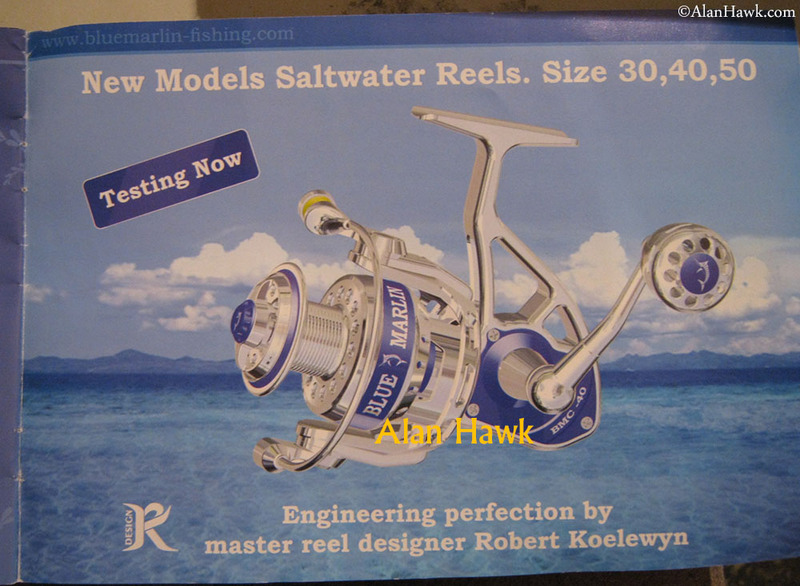 My Makaira spinning reels which I bought months ago are supposed to ship this week though, and considering the record readers' demand I might delay other reviews a little bit and give priority to fishing and reviewing the Okuma. Keep watching the News section for updates and announcements. Hope you found this enjoyable. UPDATE: following the review Blue Marlin made 3 important updates; 1) Drag has been upgraded 2) Right side of the drive gear shaft was reinforced by enlarging the support bushing 3) Bail wire of the 60 no more hits the knob. Also the pinion was changed to marine bronze. They sent me 2 upgraded reels to test, and I'm very satisfied with the new drag's performance, the strength of the gear shaft, and the smoother feel of the gearing.